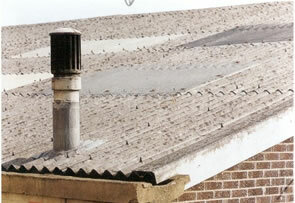 These are mainly made up of large sheets of corrugated asbestos cement; they are often found on industrial or farmyard buildings, but can also be found as roofs on garages and sheds. They are often covered in moss and other growths as they've been there for many years. This has a shape and structure similar to roof sheeting, and is often found on walls/as walls of buildings with asbestos cement roofs. 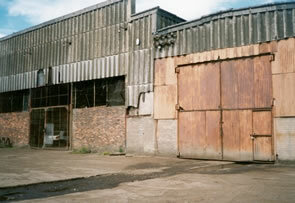 These are often attached at the end of cement roofs in warehouse type buildings. These may be found in boiler systems (including domestic) air conditioning and ventilation systems. inert coal tar pitch. Asbestos cement was added to strengthen the material. Examples of articles include water tanks, fire surrounds and pipes. Work on any type of asbestos can be dangerous. Work with asbestos cement can be carried out by non-licensed workers who are appropriately trained. This work would generally not need to be notified. If the work is likely to cause significant break up and deterioration of the material e.g ‘dropping an asbestos cement roof’ then notification would be required. 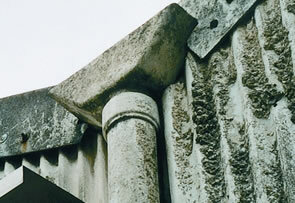 There may be very exceptional circumstances where the asbestos cement has been so badly damaged that there is significant risk of exposure to asbestos fibres. In these rare cases a risk assessment will help to determine if a licensed contractor is required. Asbestos essentials includes a number of task sheets which will show you how to safely carry out non-licensed work on asbestos cement products. If there is uncertainty to whether a material is asbestos cement then a competent asbestos analyst will be able to carry out a water absorption test. This will determine if the material is asbestos cement or if it is another asbestos material that may require a licensed contractor to carry out the work.